I’m peering through binoculars at dots bobbing up and down. 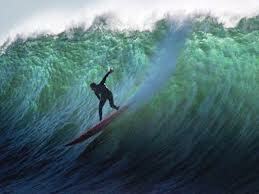 I see them in between one-inch high waves at the Mavericks Surf Competition. Then something happens … The Wave emerges. A surfer propels himself down the face of a 30-foot giant aqua-blue wall. The top of the wave folds like a used Thanksgiving napkin and the surfer disappears into The Tube, swallowed. My breathing stops, anticipating, will the athlete reappear? While waiting my mind wanders to my first athletic endeavor and that of every city girl with a piece of chalk in her hand . . . hopscotch. Yes, the children’s sidewalk game where we balance and jump on one leg, instinctively calculating ballistics before we toss our marker into poorly drawn squares. 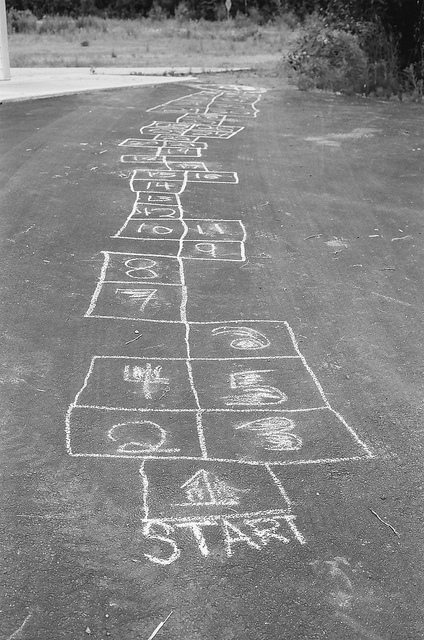 Hopscotch, a sport for strong, skilled athletes. We trained for years. In just over 13 months, from our birth, we mastered synchronizing our feet, ankles, legs, knees, hips, spine, arms, shoulders, and head to move from one set of embracing arms to the outreached arms a short distance in front of us. Over the next year we completed our first marathon over kitchen floors and living room carpets. Some of us incorporated stair repeats. Once we ran, we never stopped. We were endurance toddlers. Our training continued, constantly climbing the ladder on our favorite slide and using our abs to navigate the slope, ensuring we stayed within the low, cold, metal lips. By kindergarten we were jumping rope. With every contest we competed against ourselves as well as the reigning first grade champion. We desired to be in first place. We practiced and played with determination to win. It’s also during this time we risked bodily harm. We were fearless when we wrote to Santa – we’re ready – we needed a two-wheel bike. Those first days without training wheels frequently resulted in scraped knees and bruised elbows. But we continued; we must learn this skill. With nerves and experience we soon used our power and peddled, alone, to our friend’s house. As the lone surfer emerges, he flips the nose of his board and starts to paddle out into open water to try again. It never crosses the surfer’s mind to head for the safety of the shore. It was the same for us when we were kids. Someone might say comparing Mavericks to hopscotch is comparing the sun to birthday candles. Nay, I say. Sometime in our lives, we, too, had athletic skills that represented equal ferocity. Today is the surfer’s day and the waves his playground.